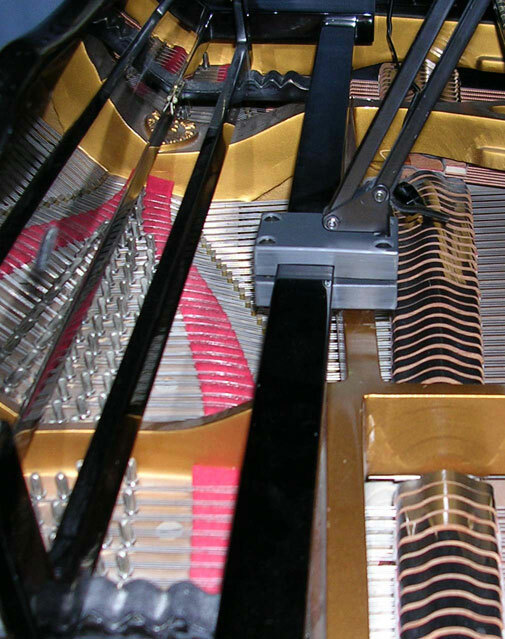 The piano lamp clamp is made in Canada. CNC-machined made of PVC Plastic. It will fit most grand pianos with a similar type of wooden support as part of the music desk, measuring 7/8″ thick by 1-3/8″ width, (2.4 cm x 3.5 cm), (shown on a 7′ Young Chang grand piano). It will also fit on Yamaha, and Steinway grands. Both pieces are identical allowing them to self-adjust to the music desk on your grand piano. If your music desk is wider than 1-3/8″, (3.5 cm) Concert Design will cut the PVC material to fit.